Here it is, folks: the first honest-to-goodness screenshots from Google Chrome, which you can now download for yourself. You can see the main tab setup, the settings windows, the new tab page and the Incognito window. Want to see more? Let us know what you're interested in in the comments section and we'll add to the below gallery. Don't worry, Mac and Linux folks; there'll be a version for you soon enough. Hit the jump for our gallery and initial impressions.Our first impression of Chrome is that it's nice and fast. There's very little lag opening pages and the entire interface feels very streamlined. Opening it is insanely fast, it's noticeably faster to get running than either IE or FF. I love the New Tab page, which displays your most-visited websites, recently-visited bookmarks, and recently-closed tabs. I can see this coming in handy really often and it saving lots of time (in the long run, when you add up the seconds saved). When the window is maximized, there's very little interface, bringing to mind those true full screen modes in IE. You can instantly kill any Flash element in a page using the task manager without closing the page itself, which is great. The download bar doesn't indicate progress, it just shows a megabyte number. Weak. UPDATE: There is a circular progress bar that works when a file's size is known -Thanks, Dave The look and feel of the browser is very similar to the Opera standard skin, especially when noted that the new tab page is kind of cribbed from them as well. Dragging tabs in and out of windows is awesome, with a transparent version of the page pulling away with your mouse. The fact that you can pull tabs out of windows as well as combine windows is a great touch. Everything involving the tabs feels very, very smooth. You can resize any text window on a page by dragging its bottom right corner around. In the Windows Task Manager you can see your different tabs as separate instances of chrome.exe, and you can shut them down individually. You can't see which is which, however, so you might as well use the Chrome Task Manager. But they weren't lying about each tab being its own process. One thing I definitely miss from Firefox is the search bar with the multiple search engines pull down. I know that you can fiddle with the address bar and use it as a search engine as well, but if I want to make a specific search it seems easier to just go to that quick pulldown. Maybe I'll get used to using the address bar, we'll see. The tabs in Chrome do have a couple of annoying little quirks that aren't in FF. 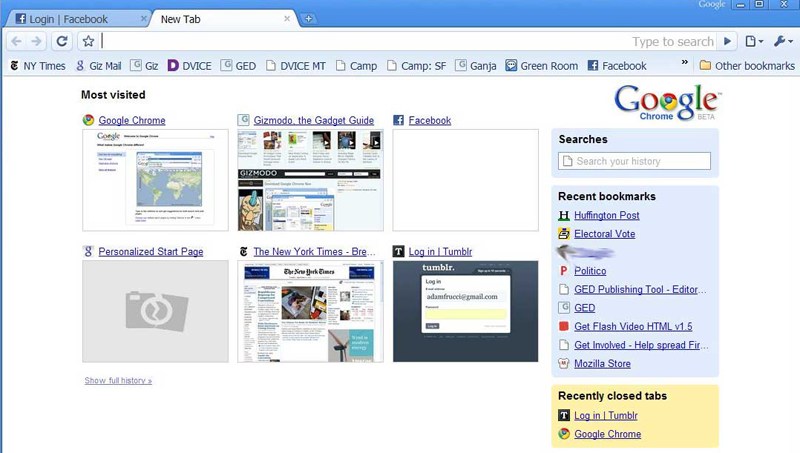 For one, tabs remain the same size no matter how many are open rather than stretching to fill the window. That makes it difficult to tell what's in each tab due to how small they are. Making it more confusing is the fact that new tabs open between the tab you have open and the closest tab rather than putting new tabs at the end. This makes it easy to lose track of your tabs if you like to keep them orderly. Chrome needs to get some theme support in a bad way.